This image contains the Tree of Life, a river, lightening, hail and the powers that be. The trunk of the tree aligns with the colors of the Chakras and in the heart is the six-pointed star a symbol of Creation. The Father God figure rides on the white eagle and carries the gift of the peace pipe. The Tree of Life is an important and powerful symbol in nearly every culture. With its branches reaching into the sky, and roots deep in the earth. It is both a feminine symbol, bearing sustenance, and a masculine, visibly phallic symbol- another union. The tree finds its home in both the Earth Soil and the sky Air. It continues to give birth to itself through the many connected root systems that are hidden below the ground and the seeds that it sends upon the winds of the sky. Everyone who knows me knows I am a painter. Most everyone who knows me knows I Pray out doors in nature everyday and most people who know me know I am a rock person. 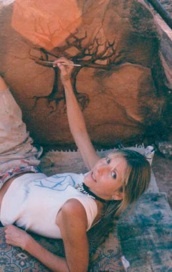 Therefore, when Altar Rock Art came into my life it was a natural flow, like giving birth the ancient way. The giant stones fell silent and the heart beat of the Earth continued through out my Spirit of bringing the Ancestors through with paint and prayer. All Indigenous peoples believe, to reach the Heart one must first find the Mother, the Divine Feminine Mother. In the understanding of the people of the Earth, who honor the Mother, as alive and feeling, touching breathing very conscious Being, way beyond our domesticated, conditioned beliefs that the modern world has taught us. The Earth is not just mere dirt and rock. She IS alive. The Divine Mother God in the feminine form abides in the heart of every being and in all Universes without end. She is the divine creatrix who has manifested forms of consciousness in union with the eternal Infinite Supreme Being, “God the Father.” In truth, speaking of them as two creates the illusion of separateness, these two, are not two. Rather, they are inseparably bound for all Eternity as One. Then I saw the Father God Tree of Life standing not far off to my right. The lines of old again I followed and soon came to find a river of Life. The Tree blooms the Lotus Flower and fashions the symbols that mark the hour. He journeys on the back of White Eagle holding Masculine in balance, freeing the ego. Learning on our life path requires being able to adapt to a continual flood of new information and ideas while continuously re-evaluating the old. Think of a tree. At first it starts out as a seed, and you think of it as a seed. But after it's planted in the ground it sprouts into a seedling, so now it's a seedling. Before long it grows into a tree, but then one day it flowers and grows apples - now you know it's an apple tree. What if you rejected that and kept calling it a seed! How many of us do that with our own identity, forgetting we are apart of a much bigger picture? Although the language of humanity extensively varies, there is one language we do all speak and understand painted on rock walls all over the earth. Although we would not understand the spoken word of our ancient ancestors 30,000 years ago, we can understand the language of art. This language is almost archetypal in its design. We see it in nature, in the weather patterns and in our interactions with the natural world. No matter what age we live in or where we live, these archetypal symbols also speak a universal language. Leaving us clues in an open Source communication so we can rediscover our origin in history. This is obviously something our ancestors understood. For them the archetypal is as real as the physical-material. It appears that the physical world is a reflection of the archetypal spirit-code. The Tree of Life Alchemy is the root operating system hidden in the mysteries of the Mother Earth and touches the Universes in the cosmos.